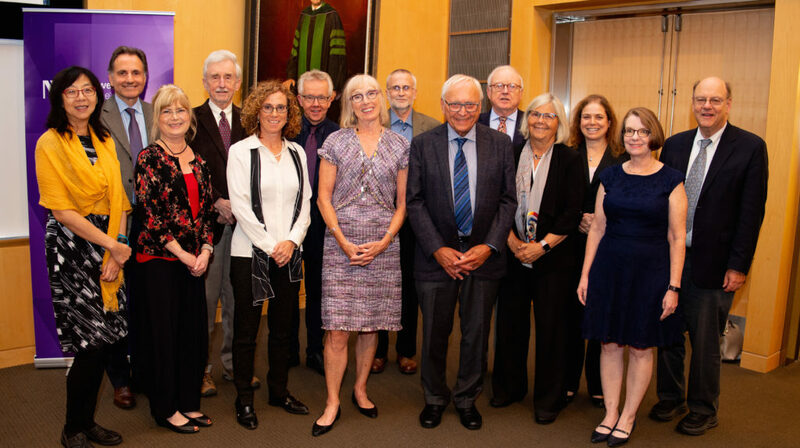 Robert Goldman, PhD, and his wife, Anne Goldman, center, joined by organizers and presenters at a symposium celebrating his career at Northwestern. 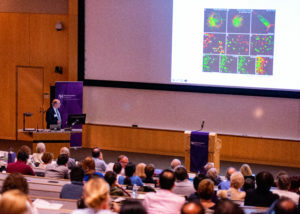 Robert Goldman, PhD, the Stephen Walter Ranson Professor of Cell Biology and chair of Cell and Molecular Biology, was honored at a recent symposium celebrating a distinguished career that has spanned nearly 40 years at Northwestern. The symposium, held September 25, was attended by many of Goldman’s fellow scientists, friends, family and mentees, and featured a full day of scientific presentations, remarks and tributes. Goldman, who has served as chair of the Department of Cell and Molecular Biology since 1981, is a recognized authority on the structure and function of intermediate filaments in the cytoskeleton and nucleoskeleton. The symposium featured scientific presentations from leading investigators in the field of cell biology. The symposium was organized by Kathleen Green, PhD, the Joseph L. Mayberry, Sr., Professor of Pathology and Toxicology in the Departments of Pathology and Dermatology, with help from Karen Ridge, PhD, professor of Medicine in the Division of Pulmonary and Critical Care and of Cell and Molecular Biology, and John Eriksson, PhD, professor of Cell Biology and director, Turku Centre for Biotechnology, University of Turku and Abo Akademi University, Finland, who also served as a moderators. Green also delivered an afternoon address on her own research, on desmosomes in tissue morphogenesis. The program featured a wide array of presentations by leading investigators in the field, including scientists from Harvard Medical School, the National Institutes of Health (NIH), the Carnegie Institution for Science and Cold Spring Harbor Laboratory, among others. Thomas Dean Pollard, MD, a cell biologist at Yale University, discussed his collaborations with Goldman and his lab’s discoveries in actin filaments. “I never dreamed in my wildest dreams that we’d get to this degree of progress,” Pollard said. Throughout scientific discussions, presenters also remarked on the impact Goldman has had on their lives, both personally and professionally. “We all think Bob is the greatest guy in the world,” said Robert H. Singer, PhD, of the Albert Einstein College of Medicine. In a video tribute, Francis Collins, MD, PhD, director of the NIH, delivered a musical performance. 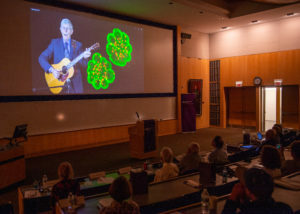 The closing session featured video presentations in honor of Goldman, including a musical performance from Francis Collins, MD, PhD, director of the NIH, delivering an original song narrating Goldman’s research and career. “Looking over the program, Bob, I can see that some of the biggest rock stars in cell biology have turned out to shine the spotlight on your many contributions to this vital field,” Collins said. In his closing remarks, Goldman thanked Green and all those who organized and attended the symposium, including scientists who traveled from as far away as Finland and Japan to celebrate. 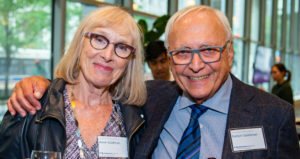 He also expressed gratitude for the support of Dean Neilson and the Northwestern community, as well as his family, especially his wife, Anne Goldman, senior research associate. Goldman also described the rise in interest in intermediate filament (IF) research over the course of his career. “I’m happy to report that the field of IF research is now taking off,” he said. Goldman received his doctorate in biology from Princeton University in 1967 and was an American Cancer Society Eleanor Roosevelt Postdoctoral Fellow at the Royal Postgraduate Medical School in London and the MRC Institute of Virology in Glasgow. He served on the faculties of Case Western Reserve University and Carnegie-Mellon University before joining Northwestern. Robert Goldman, PhD, and his wife Anne Goldman, at the symposium reception. Goldman, who has published his work in more than 400 scientific papers, has been recognized with numerous honors and awards, including the Ellison Foundation Senior Scholar Award and a MERIT Award from the National Institute of General Medical Sciences. He is a fellow of the American Association for the Advancement of Science and was elected to serve on its Board of Directors. In 2008, Goldman served as president of the American Society for Cell Biology. Goldman’s current research focuses on the role of cytoskeletal intermediate filaments in regulating cell shape, mechanics, signal transduction, adhesion, cell motility and molecular cross talk with microtubules and microfilaments. His laboratory is also investigating the roles of nuclear lamins in regulating nuclear architecture and chromatin organization. Goldman is also a professor of Medicine the Division of Pulmonary and Critical Care and a member of the Robert H. Lurie Comprehensive Cancer Center of Northwestern University.